True Swiss wines are hard to find in the U.S.
We landed a few at our Rock Hill location. Check them out. From a terraced vineyard in Vétroz, the 2016 Fendant de Vétroz "Les Terrasses" opens with a pretty intense bouquet of ripe white, yellow and citrus fruits with discreet aromas of crushed stones, stirred yeast and lime blossom. Medium-bodied, fresh and very elegant with piquant but perfectly integrated acidity and lovely salinity on the finish, this is charming and characterful Fendant (aka Chasselas) with pretty good tension. This is a great drinking pleasure. Serve it as an aperitif or with white meat, fish or cheese. From clayey schist and moraine soils, the 2016 Petite Arvine offers a lovely clear, precise, fresh and intense bouquet with ripe, flinty-mineral, rather tropical fruit along with floral aromas. Lean, pure, straight and very elegant the palate, the 2016 reveals a delicate mineral freshness and crystalline structure with some smoky notes and a long, salty-vital finish. This is a medium to full-bodied, pretty complex and persistent yet really delicate Petite Arvine with a stimulatingly piquant finish. Fermented and aged in stainless steel, this is a delicious aperitif and a perfect wine with fish. Its elegant, crystalline and refreshingly grippy character reminds me of Riesling. 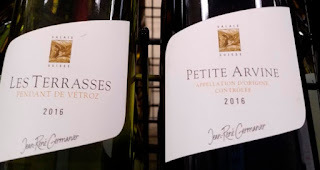 Petite Arvine—the Riesling of the Valais?